You work tirelessly to help drive our nation forward. And that’s why we have a new scheme to help you earn more! 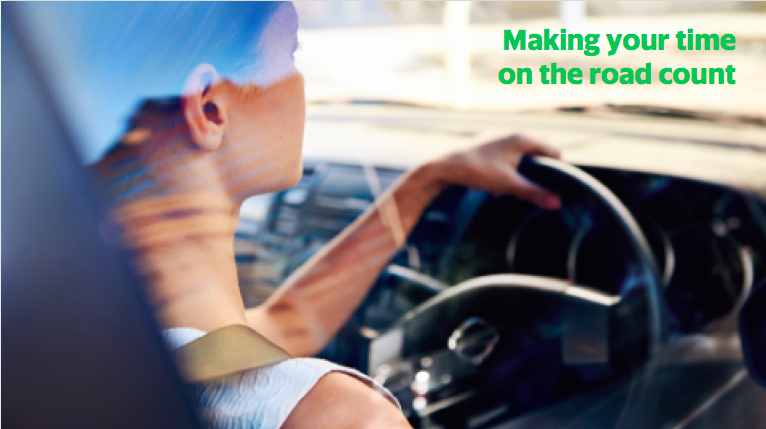 Because we value our hard-working drivers, we want to make sure you’re rewarded for your effort and commitment with a brand-new incentive scheme. While there is usually a strong demand for rides here in sunny Singapore, we know it may not always be the case. When you are doing a great job by staying on the road, we want to make sure that you are properly rewarded. That’s why we’re excited to introduce Grab’s Peak Hour Hourly Guarantees. These promise a level of income despite the ups and downs in demand that are beyond your control. It means you are rewarded for staying online to serve your passengers, even when demand levels or quality may not be optimum. For an example: Imagine Grab driver, Mr Tan, drives from 2pm to 6pm on Sunday and completes seven trips. Under this new scheme, he is guaranteed at least a minimum earning of $100! How does that work? Because Mr Tan carried on driving, kept his app turned on and completed seven trips between 2pm and 6pm, therefore despite low demand, he’s still eligible to earn $25 an hour. We want to reward our drivers, even in tough times. Under Grab’s Hourly Guarantees Mr Tan will earn $25 an hour for those four hours — bringing his total earning to $100, excluding surcharges (e.g. waiting time, ERP, additional stops). In a nutshell: under this scheme, you could double your earnings. We want to show our commitment by rewarding your efforts to stay online and complete trips. This rewards system is just an example of how much we appreciate all the hard work. That’s why from now on, even when circumstances are uncertain, you are still guaranteed a comfortable income. Still have questions? No worries — check out our FAQs for more details. Q: What is the Grab Hourly Guarantees programme about? A: Grab Hourly Guarantees provides Grab drivers with a level of income certainty, especially during times of low-demand. Q: Will I earn more with this programme? How do I maximise my earnings? A: Drivers will earn a guaranteed fare level for their online time. If the total earnings are less than the hourly guaranteed fare, we will top up the difference. The longer you stay online and complete trips, the more you earn! Q: What happens when I go offline for a break? A: Feel free to take a break! The amount you receive is based on hitting a number of trips within a specific time block. So as long as you do that, you will still get the same Guarantee Level per Hour. Q: What if I am online for only 0.8 hours? A: In this case, the amount will be pro-rated (to the closest 0.1 hours). 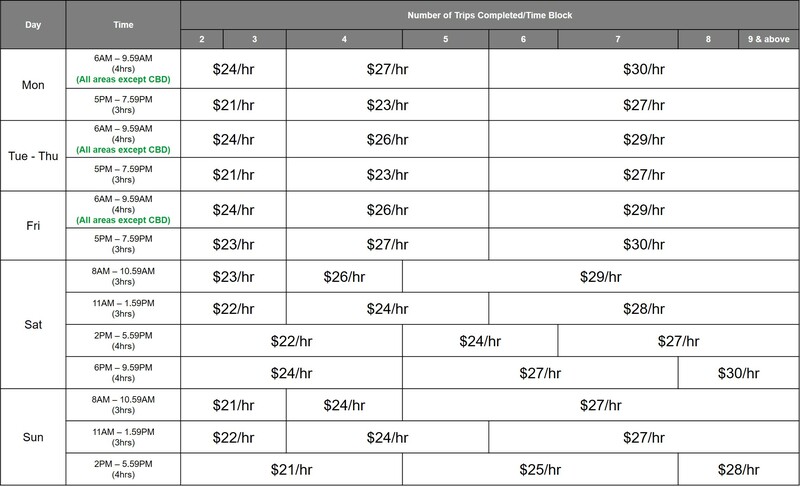 For example, if the time block shows $25/hr but you were only online for 0.8 hours, you would be guaranteed $20 instead. Q: How are my earnings calculated? A: Each time block has a different hourly guarantee level, depending on the number of trips. Mr Tan drove from 6pm to 10pm. He completed 4 online hours. During this time, he completed 6 trips (total fare: $50). This means that instead of earning $50, he now stands to make $108 for total fares and we top up the difference of $58 before commission deductions. The amounts shown above excludes any surcharges (e.g. ERP, waiting time, additional stop). Q: If Mr Tan completed 6 trips but he’s only online for 3 hours, how much does he get? Simply put, the longer you stay online, the more you earn. Q: Do commissions apply to Hourly Guarantee Incentives? Q: Will I still be eligible for other incentives, in addition to Grab Hourly Guarantees? A: Yes, you are still eligible for the other incentives in addition to this Hourly Guarantee scheme. Currently, there are no changes to other incentives already available. The Hourly Guarantees programme is separate from other Grab incentives (e.g. Guaranteed Fare Boost, GrabShare). Q: Which Region does the Grab Hourly Guarantee apply to? A: The Grab Hourly Guarantee applies to drivers in any region. Q: Do I need to fulfil any criteria to qualify for the Grab Hourly Guarantee? A: Maintain weekly AR, CR minimum of 85% and 10% respectively. A: GrabCar, GrabShare, Grab Family and Grab 6 seater Economy. Q: How do I make the most of this incentive? A: Simple: just turn your app on and keep driving!